The Taxidermic Arts’, or, why is taxidermy not art? Natural History museums are an incredible visual experience, but they are generally considered to be something very distinct from an art gallery. Around the turn of last century, there was a movement afoot to erase, or at least blur, such distinctions. The discussion has a close relationship with the development of photography and traces a number of issues around artistry, naturalism, representation, copies. Nathaniel Prottas’ paper ‘The Taxidermic Arts’, or, why is taxidermy not art?’ traces the history of the ultimately short-lived proposition that taxidermy should be considered a fine art, and offers his own analysis on why taxidermy in fact destabilises the very notion of art. Prottas’ paper begins with the death of Carl Akelely, the most renowned taxidermist in history. In the years preceding, and with particular intensity during the couple of years following, Akelely’s passing, a number of writers and practitioners affiliated with the field had been calling for the taxidermist’s status to be elevated from a trade to an art on par with painting and sculpture. In conveying Akerly’s position as the epitome of a taxidermic artist, Prottas’ quotes Wilfred H. Osgood, Curator of Zoology at Chicago’s Field Museum: “the quality of Akeley’s work rests not only upon his talent as an artist and modeller, but upon a rare combination of ability as a naturalist, an inventor, sculptor and practical workman’, which ‘enabled him to attain a high degree of fidelity to nature and to bring his genius to bear upon those subtleties of feeling and expression which make his work vibrate with life and individuality’. Photography impacted not only the accuracy of the poses given to specimens but the manner of their display. Until the mid-nineteenth century most taxidermied animals had been displayed along- side other works of art and naturalia. Early collectors, such as Charles Wilson Peale displayed their specimens in small white boxes, often mounted in rows on the wall that abstracted the animals from their original habitat and highlighted their aesthetic rather than their scientific aspects. 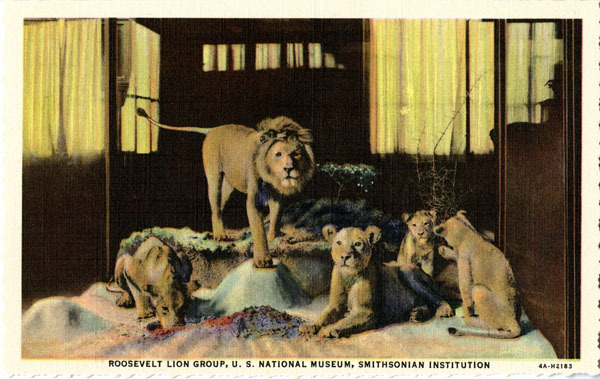 Karen Wonders, in a study tracing the history of natural history dioramas, has delineated the gradual changes in the display of animals over the mid to late nineteenth century. While displays from the earlier part of the century to some extent began the trend, dioramas such as those by William Bullock (including the famous ‘Royal Tiger’ c. 1814) were fictions that consolidated it, pairing animals on display that would never meet in reality. They may have attempted a more naturalistic setting than the previous boxed displays, but they did not yet evidence the interest in accurately observed depictions of nature that characterize those of the post-1880 period. In discussing the relationship between nature and art during this period, Prottas refers to Richard Shiff, who makes the case that “For early and mid-nineteenth-century thinkers, originality could be located in copying previous models and nature itself, an ideology that valorized an originality of sameness… In light of its new-found fidelity to nature, late nineteenth century taxidermy clearly functioned as art in this ideological purview – it copied nature exactly to create originality through sameness and proclaimed a dispassionate view of the world.” Taxidermy was taken to be most successful, when the intervention of an author was least apparent—which in itself unsettles the characterisation of the work as an art form. Taxidermy lays bare the tensions between original and copy, general and specific, document and art, index and object, and it refuses to allow these binaries to settle. Taxidermy does not need to follow photography in wanting to be an indexical art of death. It is already the death of art. Tags: art of taxidermy, IQ magazine. Bookmark the permalink.